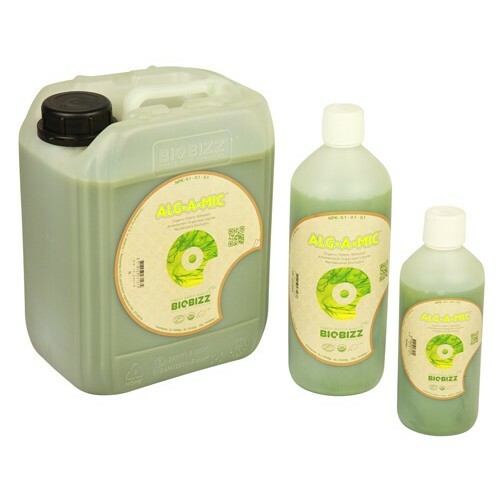 BioBizz Alg-A-Mic destresses the plant after overfeeding, deficiencies, plant diseases or after temperature differences. A stress-free plant results in larger fruits. Besides, Alg-A-Mic ensures green leaves, by stimulating the absorption of chlorophyll. Alg·A·Mic contains a low level of NPK, therefore it is impossible to create an Alg·A·Mic overdose. Alg·A·Mic can be used on every substrate, during the flowering- and growing period. Biobizz advises a dose of 1-4ml per liter water. Follow our grow schedule for the best results. Alg·A·Mic is a revitalizing product made from a high grade, organic seaweed concentrate extracted through cold pressing rather than chemical solvents. It contains a high level of natural nutrition that caters to the whole spectrum of plants needs, resulting in exuberant green foliage.